No day passes off at Tirumala without on festival or other. Hence,all days are auspicious at the abode of Lord Srinivasa. Abhdyeka Abhishekam is one such festival which emphasises the incomparahle flory of Lord Srinivasa. The essential purpose of this abhishekam is to protect the Utsava deities - Sri Malayappaswami, Sridevi and Bhudevi from damage which might occur while conducting processions and Tirumanjanam. As the festival is performed in the month of Jyesta (July) when the star Jyesta is in ascendant, it is also called as Juestabhishekam. This is a three-day festival. After the second bell, Sri Malayappaswami with Sridevi and Bhudevi is brought to the kalyanotsava mantapa in the Sampingi Pradakshina. After the Snapana Tirumanjanam on the first day, Vajrakavacham (armour studded with daimonds) is adorned to the deities and they are taken out in procession along the temple streets. On the second day after snapana Tirumanjanam, the deities dressed up with the Muthyala kavcham (the coat of pearls), are taken out in procession with all praphernalia. 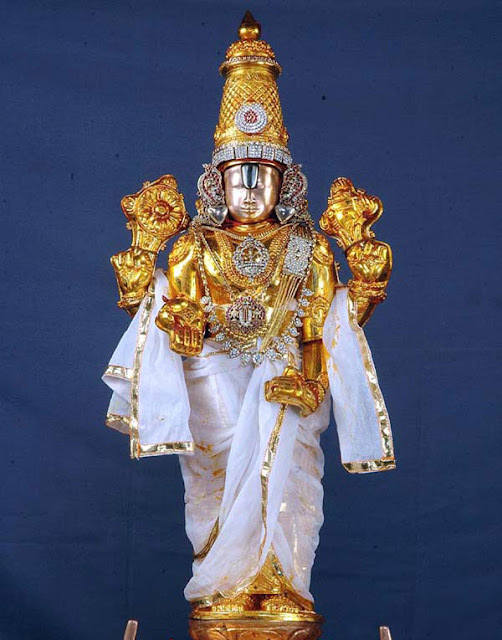 the deities are splendidly adroned with svarna kavacham (the armour of gold) on the third day. Throughout the year, the utsavamurtis put on the resplendent Svarna kavacham to the delight of the devotees.